* For generic version system board only. 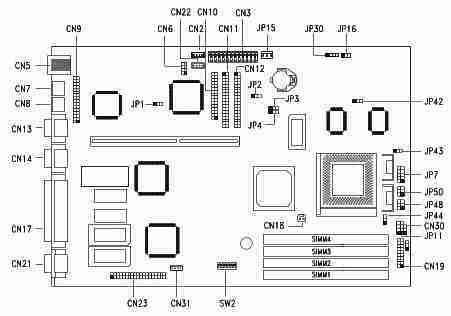 ** For Aspire version system board only. The system memory is upgradable to a maximum of 128MB via 72 pin SIMM sockets on board. These SIMM sockets accept 32MB, 60ns-70ns fast-page or EDO-type DRAM modules in capacities of 4-, 8-, 16-, and 32MB. Important: Do not mix EDO and fast-page mode DRAM in one configuration. Install only the same type of SIMMS in a bank. You can access the BIOS Setup Utility by pressing CTRL+ALT+ESC as the system is booting. At the bottom of the second start up screen you should see "To enter setup, press CTRL_ALT_ESC". Note: If the system displays the Acer Splash Screen, once you hear the beep, you should begin pressing CTRL+ALT+ESC.You may need to press CTRL+ALT+ESC continuously until you access the BIOS setup screen. Why do the USB ports on my Acer Aspire system not work? Your Aspire system was produced during the very early stages of USB. We were ahead of the technology and installed USB ports in anticipation of USB standards being released. However those standards, and the support for USB was not available at the time your system was released. Therefore, the USB ports do not function and will not support USB devices.